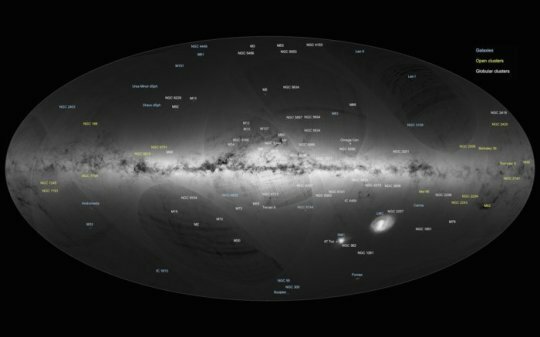 The first catalogue of more than a billion stars from ESA’s Gaia satellite was published today — the largest all-sky survey of celestial objects to date. As part of their work in validating the catalogue, DPAC scientists have conducted a study of open stellar clusters — groups of relatively young stars that were born together — that clearly demonstrates the improvement enabled by the new data. Knowing the positions and motions of stars in the sky to astonishing precision is a fundamental part of studying the properties and past history of the Milky Way and to measure distances to stars and galaxies, but also has a variety of applications closer to home — for example, in the Solar System. This first data release shows that the mission is on track to achieve its ultimate goal: charting the positions, distances, and motions of one billion stars — about 1% of the Milky Way’s stellar content — in three dimensions to unprecedented accuracy.